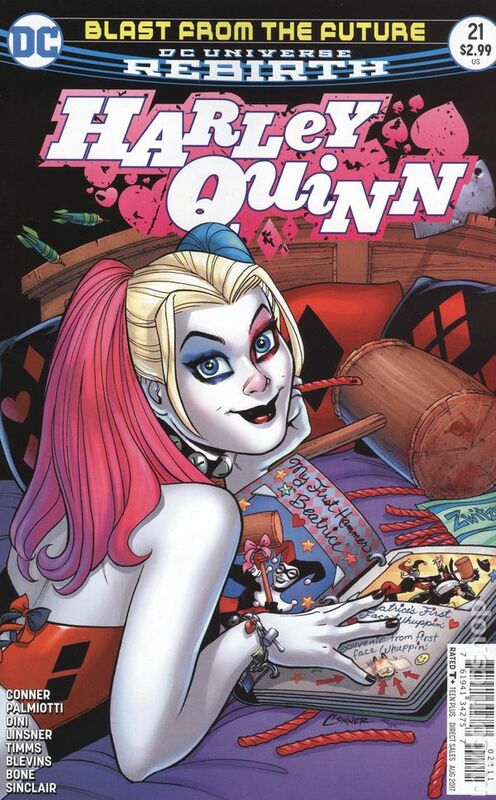 Written by Amanda Conner, Jimmy Palmiotti and Paul Dini. Art by Joseph Michael Lisner, John Timms and Bret Blevins. Cover by Amanda Conner. 'Red Roses' part one! Red Tool is done waiting for Harley to take him seriously-the poor sap's hopelessly in love with her, and it's time he made his move! Unfortunately, he's picked a moment of peak distraction for Harley! And in the backup, 'Harley Loves Joker' part five, Harley crosses paths with an old pal-Jenna Duffy, the crook known as the Carpenter! There won't be much palling around, though…Jenna's convinced Harley's trying to scam her out of one of the biggest scores of her career! 32 pages, full color. Rated T+ Cover price $2.99.